Aggregation of inventory key figures across time is usually desired as an average. 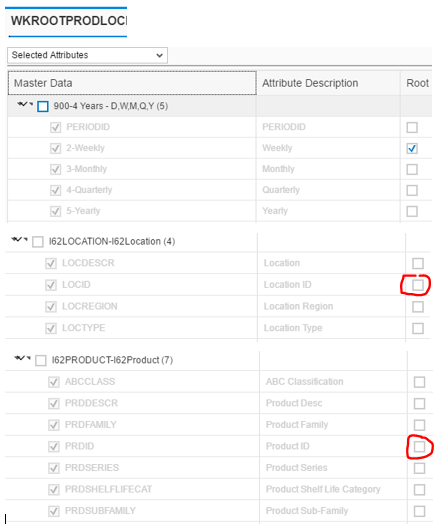 Aggregation across other attributes (product attributes, location attributes) is desired as a sum. 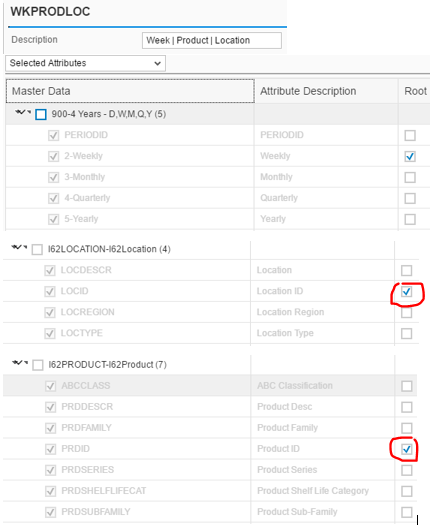 Basic configuration in IBP for inventory key figures in the SAP3 sample model (example: RECOMMENDEDSAFETYSTOCK) defines a single aggregation measure (example: SUM) at the REQUEST level. Below, I show how a key figure can be configured so that it can aggregated across time as an average and across other attributes as sum. I will use a calculated key figure AVGSAFETYSTOCK at WKPRODLOC base planning level (same as RECOMMENDEDSAFETYSTOCK). Also, we will need to define an additional planing level (say: WKROOTPRODLOC) which is a copy of the WKPRODLOC planning level but does not have PRDID and LOCID as root (key difference). This will be used an intermediate planning level to split the average and the sum aggregations. The main idea behind the configuration is to split the aggregation into two steps. First, the key figure AVGSAFETYSTOCK is set equal to RECOMMENDEDSAFETYSTOCK at the base planning level (WKPRODLOC). 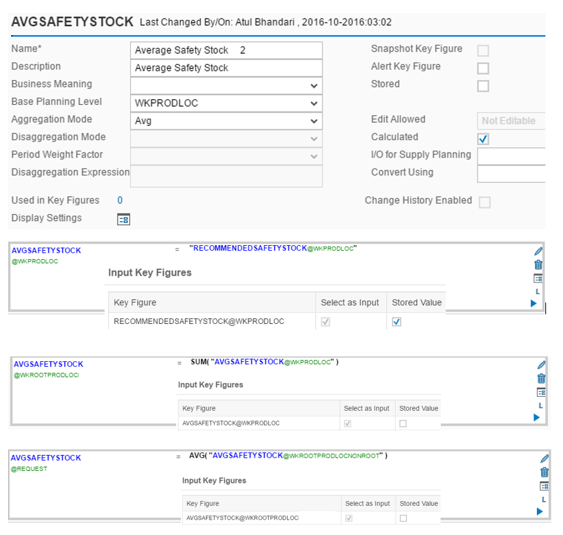 In the first aggregation, AVGSAFETYSTOCK at WKROOTPRODLOC is set as the sum of AVGSAFETYSTOCK at WKPRODLOC level. 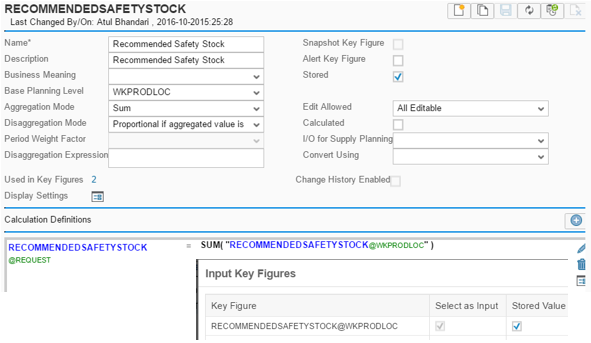 Then, in the second aggregation, , AVGSAFETYSTOCK at REQUEST is set as the average of AVGSAFETYSTOCK at WKROOTPRODLOC level. When any planning level is selected (in Excel or UI), this configuration then aggregates across time as average and sums across other attributes. Below, you can see the comparison of aggregation of RECOMMENDEDSAFETYSTOCK (sum across all attributes including time) and AVGSAFETYSTOCK with example data. In the chart below, we are looking at the key figures at the base planning level (WKPRODLOC) and so the values are the same for both. Next, in the chart below, I changed the view to look at the aggregated value by month, product id and location id. We can see that Recommended Safety Stock sums the individual 100,000 units across the 4 weeks in November (400,000), while Average Safety Stock averages the individual 100,000 units across the 4 weeks in November (100,000). Third, in the chart below, I changed the view to look at the aggregated value by week, product family and location id. We can see that Recommended Safety Stock and Average Safety Stock sums the individual 100,000 units across the 5 individual Product Ids in Finished Goods (500,000) for each week and location id. Fourth, in the chart below, I changed the view to look at the aggregated value by month, product family and location id. We can see that Recommended Safety Stock sums the individual 100,000 units across the 5 individual Product Ids in Finished Goods (500,000) for each week and location id and then also sums the 500,000 units across 4 weeks in November (2,000,000). In comparison, Average Safety Stock sums the individual 100,000 units across the 5 individual Product Ids in Finished Goods (500,000) for each week and location id and then averages the 500,000 units across 4 weeks in November (500,000). Final note: I recommend that you use this configuration for calculated inventory key figures. This is because disaggregation of stored key figure will only follow the single disaggregation rule defined for the key figure (proportional or copy). It will not do separate disaggregation for time versus other attributes. You can also use this with inventory key figures that are set to system editable which will only be disaggregated by operators in the time dimension.